Guitar intervals are the building blocks of music. Everything from chords to scales are built from intervals. This means if you can build a strong understanding of intervals, you will grow a strong understanding of music. In this lesson let’s take a very simple look at intervals and how they work. Music theory can often be confusing and intimidating to learn, so I’ll keep everything as clear as possible. 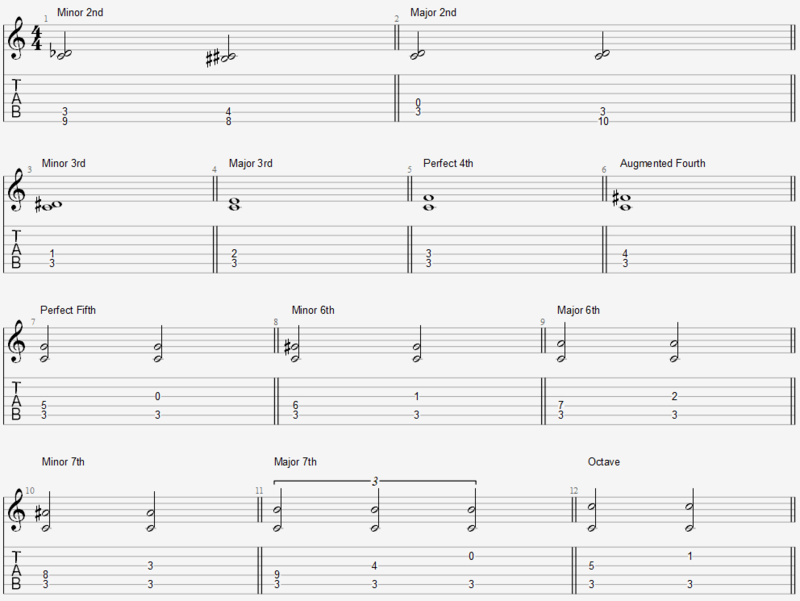 The diagrams will use both standard notation and guitar TAB so you can use whichever you prefer. I recommend having your guitar with you so you can play the intervals in the examples. By the end of this lesson you will have a solid understanding of guitar intervals and will be able to confidently move on to other music theory topics such as chords and scales. After watching the above video, keep reading as the examples go into more detail on what intervals are and the different types on guitar. An interval is the space between two notes. There’s a lot of jargon and confusing language used when talking about intervals, but an interval is just the gap between two notes. Different distances between the notes are called different names because they sound different and give off a different feel. The first note you play in the above example (the 5th fret) is what we call the root note. This is the term for the starting point of the interval. You might have heard about root notes for chords or scales (eg: the note ‘C’ is the root note for the chord ‘C Major’). 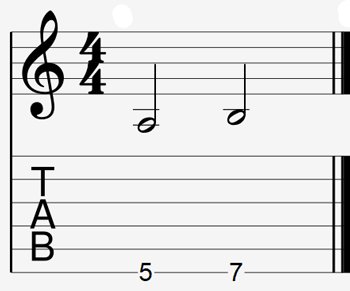 The second note you play in the above example (the 6th fret) is the interval. This note is one fret higher than the root note. In music theory we call this distance a semitone or half-step. You may have heard one of these terms when guitarists talk about different tunings (eg: tune the guitar down a half-step). So remember each fret you move up on your guitar, you’re moving up a semitone or half-step. In this example the root note is the same, but the interval is different. Now the distance (or interval) between the two notes is two frets. You can think of this as an interval two half-steps or two semitones. But as you can probably guess, another way of saying two half-steps is to say a whole-step. It’s perfectly fine to say two semitones, but we can also say a whole tone. You can probably guess that ‘semi’ means half. While all this jargon may feel confusing – just remember that the distance between the notes is what matters. The terms ‘semitone’, ‘whole tone’, ‘half-step’ and ‘whole-step’ are just used to measure the distance between the notes. These terms just make it easier for different musicians to talk to each other. For example if you told a pianist or violinist to play two notes and the notes are two frets apart, they won’t know what you’re talking about. But if you say the notes are two semitones apart, they will know exactly what you mean. Before we look at what different types of intervals are called and why they’re important to learn, let’s look at two ways intervals can be played. Once you understand the two ways of playing intervals, you will find it much easier to understand chords and scales. All of the above intervals are melodic intervals because all the notes are played one-at-a-time. Some of them are played on the same string, while others are played on different strings. The distance between the notes in the above example are all different, but they’re all melodic intervals. All that matters is that the two notes of the interval are played separately. To help you remember these intervals, think of a melody. On guitar a melody is a lick or riff where you play one note at a time. Any time you play one note at a time on guitar, you’re using melodic intervals. If you play a scale, that’s a series of melodic intervals. When you play a solo or lead line, you’re using a lot of melodic intervals. All of the above examples are harmonic intervals. You might even recognize one of the shapes as a power chord. A power chord is one type of harmonic interval you will learn about later. If you look at the above examples and think to yourself “those are just chords”, you’re on the right track. Harmonic intervals are the building blocks of chords. If you look closely at the examples of melodic and harmonic intervals, you might notice they use the exact same notes (even if the note positions looks different). The only difference between the two is the melodic intervals are played one-note-at-a-time and the harmonic intervals play the notes at the same time. The reason it’s important to know the difference between melodic and harmonic intervals is because they are used in different ways. For now, think of melodic intervals as the building blocks of scales and harmonic intervals as the building blocks of chords. 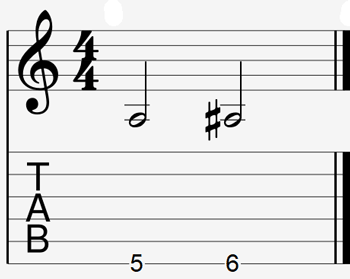 When you play a solo on guitar, you’re using a lot of melodic intervals. When you play a chord progression, you’re using a lot of harmonic intervals. Now that you know what an interval is (the distance between any two notes) and you know what melodic and harmonic intervals are (intervals played one-note-at-a-time or played-together), let’s look at the names for different intervals and what they sound like. We’ll look at all the intervals all the way up to an octave. In the below examples we’ll use the note A as our root note. The reason why we’ll do this is so we can use the open A string as our root note which makes it really easy to count the distance between the notes. We’ll also look at both the melodic and harmonic intervals so you can hear both of them in action. Beside the interval names, I’ll list all the different ways you can measure the interval (eg: in half-steps, frets or semitones). It’s up to you which way you use, but try to learn all three so you can talk to any musician without any problems. Try playing all of the intervals as you read through this so you get a feel for what they sound like. Each interval has a unique sound and it’s good to start learning those sounds now. If your guitar is perfectly in tune, when you play the harmonic interval it should sound like a nice thick tone as both notes are exactly the same pitch. If your guitar is slightly out-of-tune, the interval will sound unstable or wobbly. Checking unison positions like this is a great way to quickly check if your guitar is in tune. For the harmonic interval, we need to move the interval note to a different position so we can hear both notes at once. We need to do this for the first few intervals so you can hear both notes. You might notice that the melodic interval sounds fine, but the harmonic interval sounds horrible. This awkward not-quite-right sound is called dissonance. Each interval has a different sound or quality and the term ‘dissonance’ is just one way to describe that sound. Dissonant intervals are thought of as ‘unstable’ sounding. The harmonic interval doesn’t sound as horrible this time, but it still sounds a bit awkward so it is still a dissonant interval. Some musicians think of the M2 interval as a ‘soft dissonant’ because it doesn’t sound as unstable as the m2 interval. Whether you think of the M2 interval as unstable or not, the main point to remember is that it does sound very different to the m2 interval. Both the m2 and M2 intervals are 2nds, but there is a difference in the sound you hear. Remember from now on that a little m is used for minor and a big M is used for Major. This time the harmonic interval sounds a lot better, which is called consonance. This is the term for a more stable sounding note. The minor third is a really important interval that give minor chords and scales their dark or sad quality. The Major third is also a really important interval in music. A M3 is what gives Major chords and scales their bright or happy quality. In the past (think medieval times), the Perfect 4th used to be considered ‘perfect’ consonance, hence the name. But in modern times musicians can hear the P4 interval as either dissonant or consonant, depending on how it is played. In simple terms, this means it can sound good or bad depending on how it is used. If you’re confused by the names of this interval, you’re not alone. Music theory has shockingly annoying terms like ‘augmented’ and ‘diminished’. Just memorize the interval names and you won’t need to worry about why those names are used. This is bit of a strange interval in music and as you might guess, it is dissonant. There’s another name for this interval (because two isn’t enough) that you might hear, the tritone. As you probably guessed ‘Tritone’ means three whole-tones. It’s not important to dig into this now, just know that a tritone is an interval of three whole tones. Does the harmonic interval look familiar? A power chord is simply a P5 interval. Similar to the Perfect 4th, the Perfect fifth was considered a ‘perfect’ consonant and still is today. The P5 interval is incredibly important in music and you will see it used all the time. The fact that we see it all the time as guitarists in power chords is a good example of how important it is to music. As you might guess from the minor name, this interval has a darker sound that helps give the minor scale it’s sound. The m6 is also a consonant interval. The M6 is another consonant interval and has a brighter sound than the m6. Practice comparing the minor and Major intervals to get used to this dark/bright sound. It’s one of the most important parts of music so spending time getting used to the differences in sound between the two is important. The m7 is a dissonant interval but they’re usually thought of as having a ‘soft’ dissonance. If you know any minor seventh chords (eg: Dm7) or dominant seventh chords (eg: D7), you might recognize the sound of the m7 interval as it’s a key part of those chords. This is the last interval before we reach the octave so don’t expect a ‘minor eighth’ next. The M7 is another dissonant interval. When you play it as a harmonic interval, you might notice a strange wobbly sound – similar to what you hear with the m2 interval. This is because the M7 interval is so close to the octave we hear a strange clash of pitch. The octave is incredibly important in music and on guitar. You play octaves all the time whether you notice it or not. If you play a power chord across three strings, that third note is the octave. You might recognize the octave shape later on as it’s used in a lot of songs. The octave brings us back to the starting point in terms of note names. That’s why the 12th fret on guitar typically has two markers. The 12th fret on the A string is also an A – just an octave higher. The octave is a ‘perfect consonant’ which is why it’s notated as P8. Remember that the only other ‘perfect’ consonant is the P5 – that’s why power chords usually use both the 5th and the octave. Would could keep going past the octave, but for now it’s more than enough to learn the intervals above. If you are curious, the next interval up from an octave is a minor ninth. The intervals continue all the way up to the second octave so if you do want to memorize all intervals, you only need to memorize everything up to two octaves. In a future lesson we might look at higher intervals, but for now this is enough. Let’s move on to interval shapes so you can start recognizing them in the songs you play. While the most important aspect of intervals is learning to recognize them by ear, a good starting point is to learn to recognize the shapes they make on guitar. You are probably already confident with recognizing the P5 and P8 shapes on guitar, but let’s look at all the other intervals as well. The below chart shows all the intervals up to an octave in a variety of different shapes. Most of them you will be able to play, while others may be a bit of a stretch. Move the root note up the fretboard if you can’t stretch your fingers for some of the shapes. In the below examples the root note is C on the third fret of the A string. A great way to develop your ear and really understand how intervals are used in music is with exercises. You’ve probably seen scale exercises, well this is far more useful in my opinion. Learning to jump around the fretboard using certain intervals will teach you to see the fretboard differently. It helps you avoid the trap so many other guitarists face by only memorizing scale shapes. If you know where all the intervals are from any position on the fretboard, it gives you freedom. This is such an important topic so I will be writing a separate lesson on interval exercises. For now, use the shapes in the chart above as a way to practice different intervals. Pick a shape, then practice it starting in different positions on the fretboard. Move it up and down the fretboard as well as starting on different strings. Get used to how the interval sounds. You’ll know if you’ve played a mistake as the interval will sound different in quality.